Mark Sava, former CIA station chief of Azerbaijan, lives a quiet life as a professor at Western University in the city of Baku. But his peace is shattered by both the assassination of a high-level American during an international oil conference and the arrest of CIA operations officer Daria Buckingham for the crime. Sava knows the Iranian American Buckingham well - he personally trained her - and doesn't believe she had anything to do with the murder, so he visits a CIA control center to discuss the situation with the new station chief. When no one answers the outside intercom, Sava overrides the security code and stumbles upon the grisliest scene of his career. Now, he can't help but wonder if he really knows Buckingham as well as he thought... Determined to find out, Sava soon finds himself and a partner caught in the middle of the new Great Game - a deadly intelligence war over oil that has Iran, China, and the United States clawing at each other's throats. Meanwhile, Colonel Henry Amato, assistant to the US national security advisor, is keeping a close watch on the situation from Washington. His stake in the Great Game is high - and personal. 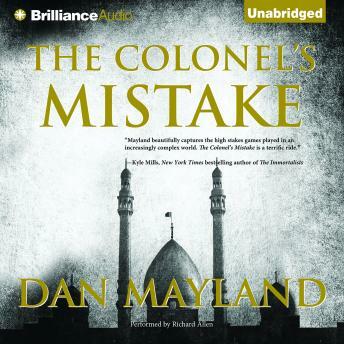 From the shadows of the world's most volatile region to the highest levels of Washington politics, The Colonel's Mistake takes readers on an unforgettable ride where the good, the bad, and the brutal play a deadly chess game of global espionage.